BigCommerce is one of the most popular platforms in the ecommerce industry. It’s an all-in-one solution that allows you to build a fully-fledged ecommerce store without needing to purchase hosting or themes from third-party companies. It’s used by a lot of big-name brands, including Toyota, Martha Stewart, Camelbak, Schwinn, Payless and Gibson. It’s a direct competitor of such platforms as Shopify and Magento, but it offers a few different features that set it apart from these platforms. Let’s check them out. This includes one of the most powerful store management and analytics interfaces the ecommerce industry has ever seen. Let’s find out what else it has to offer. BigCommerce is one of the largest ecommerce solutions available in the industry. It’s headed by CEO Brent Bellm and COO Robert Alvarez and has a team of over 350+ employees in three international offices located in San Francisco, California, Austin, Texas and Sydney, Australia. The company has garnered much success since it was founded in 2003. It’s gone on to service customers in over 150 countries around the world and has even won such awards as the Top Places to Work in 2016 (Austin American-Statesman) and San Francisco Bay Area’s Best and Brightest Companies to Work For in 2016. It’s even been featured in Forbes’ list of World’s Best Cloud Companies in 2016. Let’s see what this company has to offer you as a customer. BigCommerce is a powerful ecommerce platform, and it’s a strong competitor of other platforms that exist, as mentioned before. Let’s take a closer look at what this platform has to offer. Business owners who are just starting out or do not wish to hire a developer will be attracted to BigCommerce’s all-in-one platform, which comes with everything you need to power an online store. This includes hosting, themes and apps, giving you access to multiple payment gateways, including blogging capabilities, and more. BigCommerce is incredibly easy to use as any decent all-in-one platform should be. It’s even easy to get started with a free, 15-day trial. All you need to do is enter your email address, address, phone number and answer a few quick questions about your business. It also offers free and premium themes you can install and edit with ease. It’s also easy to create products and manage your store. More on the latter two in a bit. You’ll also save 10% when you pay annually. These plans include no transaction fees, unlimited products, unlimited file storage and unlimited staff accounts. There are also a lot of free and affordable apps. We’ll get to what makes this platform’s pricing complex in the cons list. BigCommerce doesn’t charge transaction fees on any of their plans, as stated above. Shopify, on the other hand, charges a 2% fee for every transaction a store processes if the owner uses a payment gateway other than Shopify Payments. You will, however, be obliged to pay transaction fees charged by the payment gateways you use. This is separate from BigCommerce and is something they have no control over. PayPal Powered by Braintree, Stripe, Square and Authorize.net are all popular payment gateways for this platform. This platform’s primary feature is its ability to allow anyone to build and run their own online store without having to rely on a number of different services, but it does allow you to sell in places outside of your store. This includes online marketplaces like eBay, Amazon and Google Shopping, but it also includes in-person sales through integration with Square POS as well as the ability to sell on social media through integration with Facebook and Pinterest. BigCommerce support comes in a variety of different formats. One-on-one support is available 24/7 through chat, email and phone. The knowledge base, known as BigCommerce University, also contains a lot of helpful articles in case you get stuck. There’s also a blog, webinars and help from other merchants in the community forums. BigCommerce stores are protected by multiple layers of security. This includes being PCI compliant on a Level-1 basis. Server protection comes in the form of different types of firewalls, file-integrity scanners and 24/7 monitoring. All of this security and hands-on monitoring allows BigCommerce to achieve a 99.99% uptime average and fast servers capable of sustaining heavy traffic. You’ll also have access to automated fraud detection through integration with Sift Science, a service trusted by such brands as Zillow, Airbnb, Twitter and more. All plans also come with free SSL certificates, but enterprise customers can upgrade to more premium certificates from third-party sellers. Merchants also get a break on shipping with this platform. For starters, it features a quick setup process when it comes to configuring shipping options. This process allows you to define fixed shipping rates for a variety of different locations with ease. You can also give your customers more accurate shipping quotes with real-time rates from such carriers as USPS, UPS, FedEx, Australia Post, Royal Mail, Canada Post and more. It also offers integration with ShipStation, which allows you to save time by printing your own labels for USPS, UPS, FedEx, DHL and Canada Post. You’re also eligible for shipping discounts that could be well over 50%. Enterprise customers have access to even more features when it comes to shipping. This is mainly in the form of deep integration with ShippingHQ, one of the most efficient shipping-rate calculators in the industry. It allows you to offer customized shipping rates and more accurate shipping quotes so you can cutback on overpayments for misquotes. It also allows you to set rates based on product, category, customer group, quantity, destination, dimensions and more. It also supports LTL freight, dimensional shipping, multi-origin and dropshipping. Continuing on with the ease of use section, creating products is also incredibly simple with BigCommerce. The Create New Product page allows you to enter a price, tax, SKU and/or product code as well as details on weight, product type (physical or digital), shipping, and more. You can even arrange products into categories and subcategories that can be eight categories deep. Each store can have as many as 16,000 categories in total, making this platform a viable option for large department stores. You can also assign variants to each product. The only downside to this is you can only assign what BigCommerce calls “option sets” to products, not individual options. An option set is comprised of multiple options. For example, an Apparel Set may have Size, Color and Material as options. You can add as many as 250 options to each option set, but the entire system is overly complicated, in my opinion. This is especially true if you have a lot of different products that each have a lot of different options. 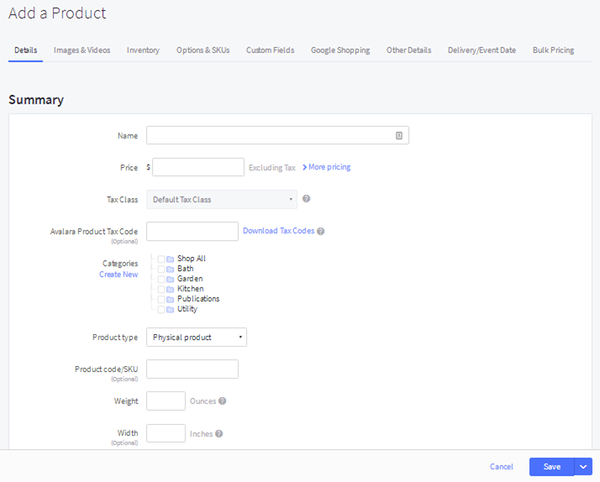 You’ll need to create custom option sets for each, which you can’t even do on the same page as the Create New Product page. 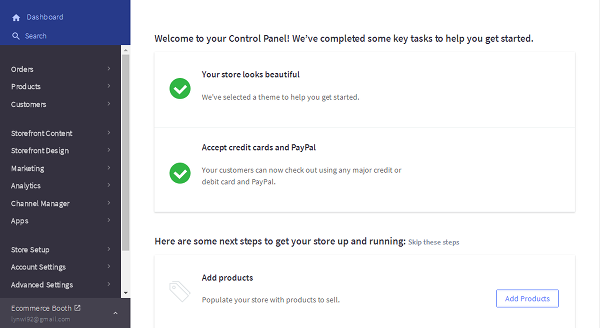 Lastly, BigCommerce makes it incredibly easy for you to manage every aspect of your store. This includes organizing the Orders section into multiple sub-sections, including Awaiting Payment, Awaiting Fulfillment, Awaiting Shipment and Pre-Orders. You can even create custom views for external sales channels, export orders, track shipments and import tracking numbers. This platform also has built-in analytics features that allow you to monitor traffic over time or traffic in real time and gain insights into how your customers shop. This means you’ll be able to see which products should be bundled together to increase sales, who’s browsing but not buying, which of your customers bring the most business to your store and which valuable customers haven’t purchased anything in a while. You can also keep an eye on merchandising, marketing campaigns, purchase funnels, abandoned carts and more. 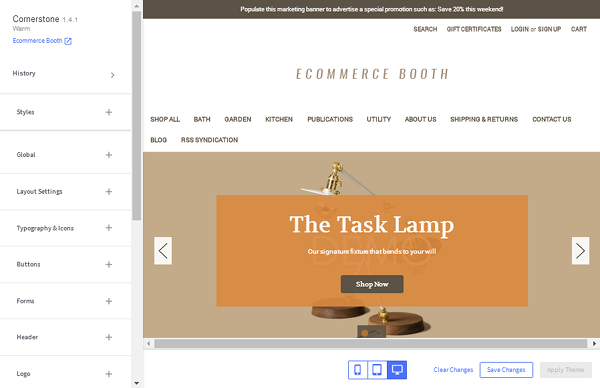 BigCommerce is a powerful ecommerce, but it’s not entirely devoid of faults. However, you’ll be delighted to know that most of them have to do with pricing and not something more serious, like poor security. Let’s go through them. This is something that caused an uproar among BigCommerce customers in late 2015 through much of 2016. The platform updated their pricing structure to what it is now, a model that charges you more as your store grows. 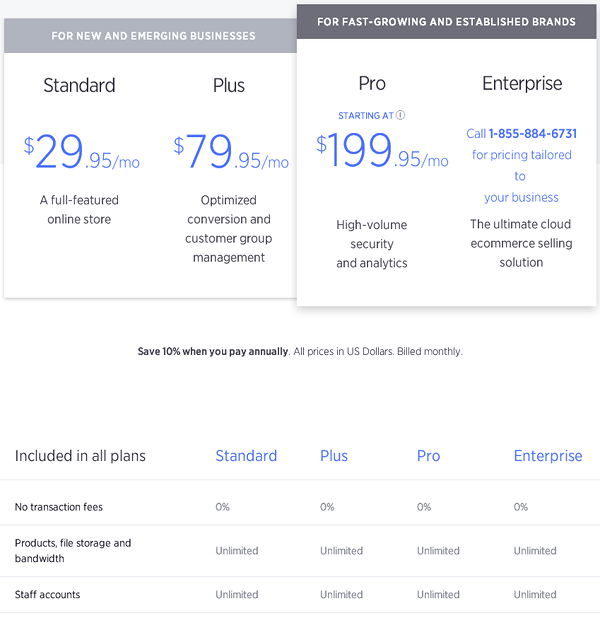 If you look at the Pricing page closely, you’ll notice there’s a row detailing limits for how much annual revenue each plan is allotted. If you read the site’s FAQs, you’ll find even more information on this pricing. It mainly concerns stores that accrue more than $125,000 in revenue per year or process over 2,000 orders every year. If you go beyond either of those numbers, you’ll pay the $199/month flat fee along with an additional $80/month for every additional 1,000 orders you process. The changes were fairly drastic for some customers, who saw their monthly rates increase from under $100/month to well over $1,000/month. It should be noted that proper notice was given to these customers, but it seems odd to charge customers more on the basis of success rather than basing it on the amount of resources their stores use. This platform’s themes have style, but some are a little expensive and can affect the startup costs for some. 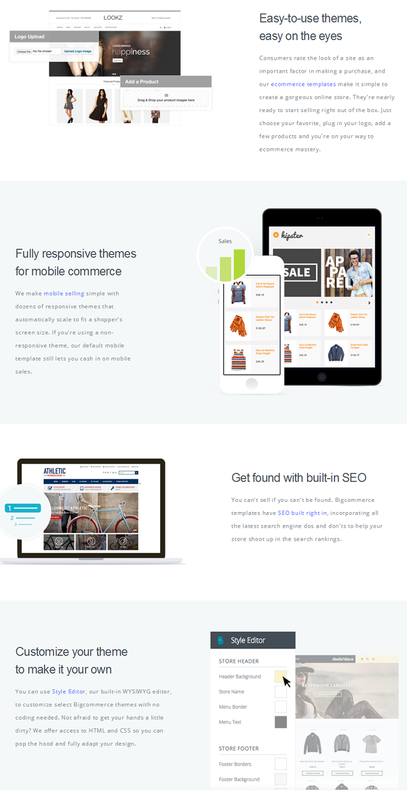 There are only seven free themes, and the most popular premium themes are either $170 or $195. This isn’t that big of a deal, but it would be nice if this platform had a lite version similar to Shopify’s that allows you to use it to build a store elsewhere. This basically means you can’t use BigCommerce to integrate an online store with your existing site nor can you integrate it with a more robust blogging platform, such as WordPress, at least not without getting technical. The theme editor is easy to use once you get the hang of it, but it can feel a little clunky when you first start out. It’s very easy to edit styles, but it would be nice to have a drag-and-drop page builder to design custom pages. My name is Danny Gibbons, and I’m the Affiliate Account Manager for BigCommerce! Thanks for the great review/write up, but I’d love to discuss a few things that I can help speak to/correct from your write up. Also, if you’re not already in our Affiliate Program via Impact Radius, let me know and I can get you enrolled so that you can earn commission from paid stores that are referred from you review!